WHAT'S UP THE PIKE? U-Md. president wants Purple Line through oldest part of campus; Goats running amok in B'ville industrial park; Historic designation endorsed for Falkland Chase apartments, saving it . . . for now. Over Thanksgiving break, Just Up The Pike took a trip down Route 1 to Hyattsville, a small Prince George's town on the cusp of a revival comparable to Silver Spring's. 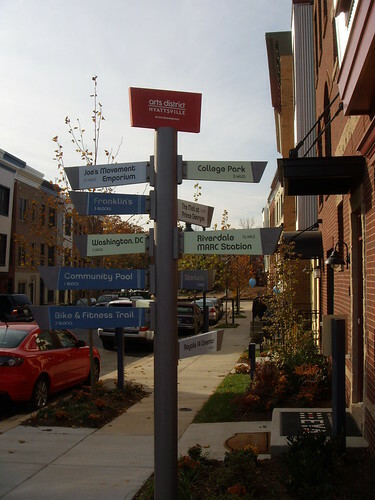 Coincidentally, the Silver Spring Scene's recent "Sister To The East" series examined the University Town Center development adjacent to Prince George's Plaza. And next week, JUTP will head over to Arts District Hyattsville, a new community which gives new meaning to the word "artist housing." Are you thinking former warehouses with paint-splattered concrete floors? Try roof decks, granite countertops - and a few thoughtfully-placed guitars for "cred." Sure, anyone can build a town from scratch. But can you build a artist/hipster colony from the ground up? We're about to find out. Hey there! I'd be very interested in seeing how things shape up with the new community. I write about artist housing communities. It's always interesting to see how new ideas shape up.